In the quest for model law, program, and solutions-oriented healthcare, both stakeholders and data are vital to sustain a blossoming industry. We are past the intersection of opportunity and uncertainty. As key stakeholders measure, enter, and participate, the impact of the fastest growing industry in America is a matter of when, not if. Realizing benefits and managing risk is happening now, and doing nothing causes harm. 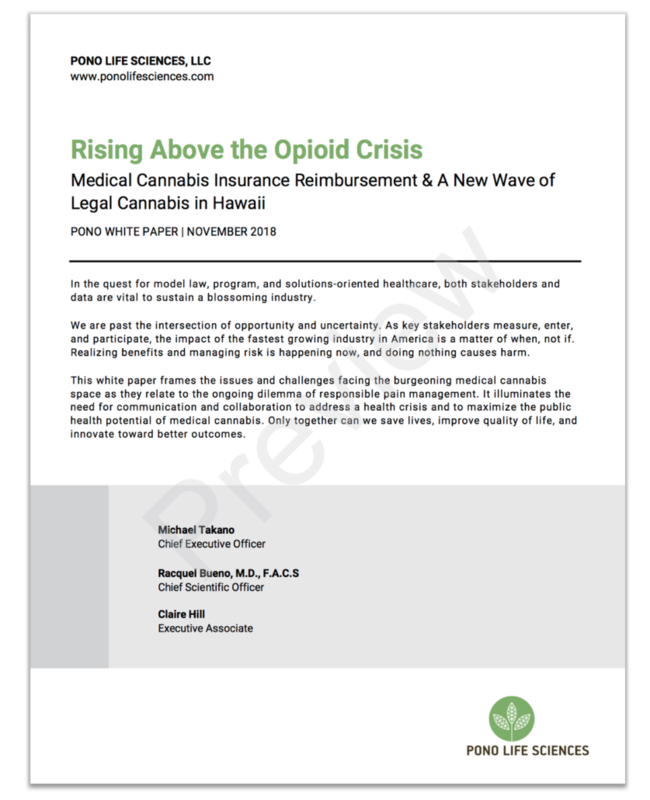 This white paper frames the issues and challenges facing the burgeoning medical cannabis space as they relate to the ongoing dilemma of responsible pain management. It illuminates the need for communication and collaboration to address a health crisis and to maximize the public health potential of medical cannabis. Only together can we save lives, improve quality of life, and innovate toward better outcomes. By checking here, I would like to receive updates and other information from Pono Life Sciences. © 2016-2019 Pono Life Sciences. All rights reserved.